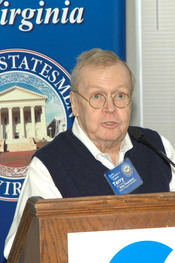 Senior Statesmen Vice President and Program Chair, Terry Cooper, talked about several trends in politics that have gone largely unnoticed. Mr Cooper was a long-time Republican political consultant specializing in issues and opposition research. Terry’s current business is political analysis. He is a native of Charlottesville and a graduate of Episcopal High School, Princeton University and the University of Virginia School of Law. Notes from Mr. Cooper’s presentation can be viewed here. Mr. Cooper spoke at the Wednesday November 14, 2018 meeting of the Senior Statesmen of Virginia. The meeting was held at the Senior Center in Charlottesville. Following the presentation, questions were taken from the audience. The program was moderated by SSV president Rich DeMong.